Definition at line 62 of file project.c. Definition at line 167 of file project.c. Referenced by gluUnProject(), and gluUnProject4(). Definition at line 40 of file project.c. Definition at line 48 of file project.c. Definition at line 217 of file project.c. Definition at line 149 of file project.c. 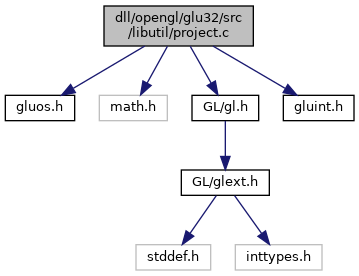 Referenced by gluProject(), gluUnProject(), and gluUnProject4(). Definition at line 100 of file project.c. Referenced by D3DXComputeTangentFrameEx(), and gluLookAt(). Definition at line 348 of file project.c. Definition at line 234 of file project.c. Definition at line 269 of file project.c. Definition at line 308 of file project.c. Definition at line 88 of file project.c.